A collection of over 11,000 video games – confirmed by The Guinness Book of World Records as being the largest in the world – has sold at auction for $750,250 (roughly £440,000). Amazingly, the bidding began at just $1. The auction, held via website Game Gavel.com, ended on 15th of June, leaving the collection’s (now former) owner Michael Thomasson a very happy man. Thomasson, a lifelong gamer, operated seven different indie gaming outlets throughout the 1990’s and spent the last decade working at a chain store. During this time, he has also been running his own online business, Good Deal Games, since 1998. “Whenever I purchased a game that did not directly come from the distributor I was able to look through all our inventory and pick out the nicest copy of a game, including grabbing the nicest box and manual”, he wrote on the item description for his mammoth collection. According to Thomasson, over a quarter of his collection were still factory sealed at the time of listing. “A few years ago, I supplied almost a thousand games to the International Center for the History of Electronic Games (part of the Strong Museum) and Shannon Symonds (the Acquisitions Cataloger for the ICHEG) stated that the games I sold them were the nicest collection of games they had ever received. And those were duplicates that were not as nice as the copies that I held back for my personal collection”. Thomasson also went out of his way to confirm that Guinness’ assessment did not count duplicates, meaning that there were no repeats in the sold-off collection, either. 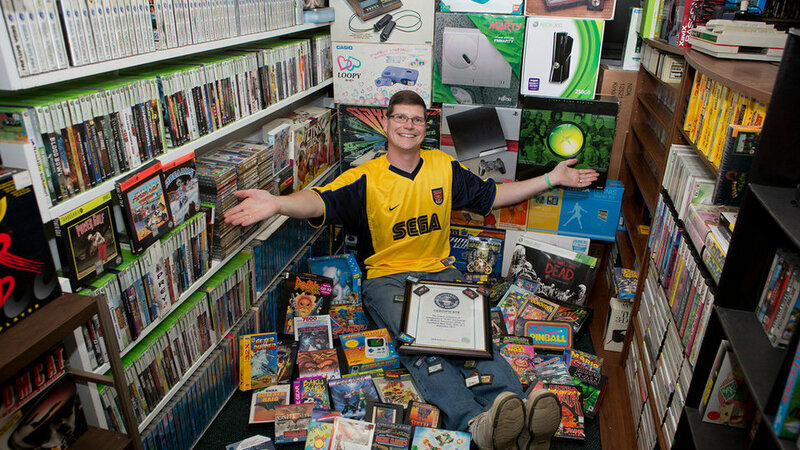 Michael Thomasson’s item description bragged, “Win this auction and you will have the largest recorded collection of games in the world – or Universe, even! I’m handing over the baton and the winner will instantly become the new crown holder, without three plus decades of meticulous hunting”. He wasn’t kidding, either! 56 bids later and Thomasson was more than $750,000 better off. The money, he claims, is being used to help his family with “needs that need to be addressed”. In 2012, when Guinness World Records initially appraised the collection, it numbered 10, 607 titles. However, in the time between the broken record and the sale, Thomasson had added a further 400 games to his collection. He also chucked in a lifetime subscription to RETRO magazine, as well as a signed copy of the issue that featured his collection. “While I do not wish to part with these games, I have responsibilities that I have made to others and this action is how I will help meet them”, wrote Thomasson, of the eventual sale.